Productivity hacks can save busy entrepreneurs time, energy and stress, especially when it can feel like their ‘to do’ list is always growing. Staying on top of day-to-day tasks is challenging and it is near impossible to set aside time for strategic thinking. So how do successful entrepreneurs find the time to work on their business strategy, publish books, regularly speak at conferences and also run high growth, successful businesses? In this post, I’ve reached out to 6 successful entrepreneurs and asked them to share their favourite productivity technique. 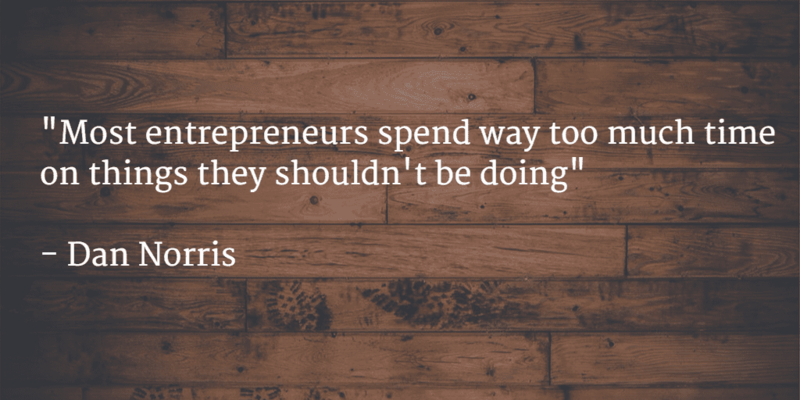 Most entrepreneurs spend way too much time on things they shouldn’t be doing. Even if they do that work productively, they aren’t productive since they shouldn’t be doing the work in the first place. The only way to solve the problem is to get good at automation (using systems to replace your work) and delegating (hiring people or services to do your work). Some of my favourite ways to automate are hiring affordable people in the Philippines to do procedural work and using tools like Zapier and Trello to automate their jobs each week or month and Slack to communicate with them efficiently. 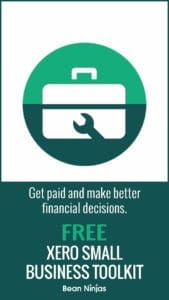 Meryl – one of the first posts I ever read of Dan’s was a step by step guide to automating the process of hiring developers. I was already interested in automation but this took the concept to a whole new level! 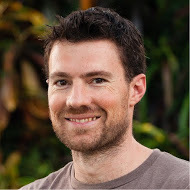 Dan Norris is a serial entrepreneur, award-winning content marketer, international speaker and the author of the top 10 Amazon best-selling small business book The 7 Day Startup and Content Machine. In June 2013 after failing at entrepreneurship for 7 years, he founded wpcurve.com, a worldwide team of WordPress developers, providing unlimited small fixes and support, 24 / 7 for a low monthly fee. After becoming profitable in 23 days, WPCurve grew to a team of 40, servicing thousands of customers and passed an annual run rate of over AUD$1m using Content Marketing alone. One small tip I was given that has had the biggest impact on improving my productivity is the “Only Touch Once” rule. This is where you immediately action and complete any small task as and when you first receive it. Previously I would read or process something, then file it or add it to a to-do list to action later. That is incredibly inefficient because you lose time managing work queues, plus the time lost in context switching is huge. To work effectively you have to manage your workflow pipelines of tasks and distractions. That means switching off all the notifications and alerts on devices, and compartmentalising your time so that you focus on the task at hand, and don’t get easily distracted. Also keep in mind that the appropriate action could be to simply delete or say no – the most successful people I know are very good at knowing what tasks and opportunities to say no to. 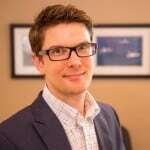 Aaron Birkby is the Entrepreneur In Residence at River City Labs. He has founded and built a software company to 6 million users in 9 countries over 8 years and successfully exited 4 businesses (3 startups, 1 restaurant). 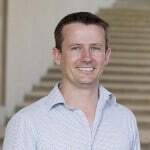 Aaron is also the co-founder and CEO of Silicon Lakes, a not-for-profit startup incubator on the Gold Coast and a member of the Queensland Government Startup Working Group. Meryl – as the Entrepreneur in Residence at River City Labs, Aaron will be a key mentor in the Accelerator Program at River City Labs powered by muru-D. The accelerator program provides an opportunity for 5 digital startups to participate in an intense 14 week program to take their startup to a global market. I am a lawyer, artist and online training creator and use all 3 skills together in my work. I need to be inspiring, unique and creative hundreds of times a week. 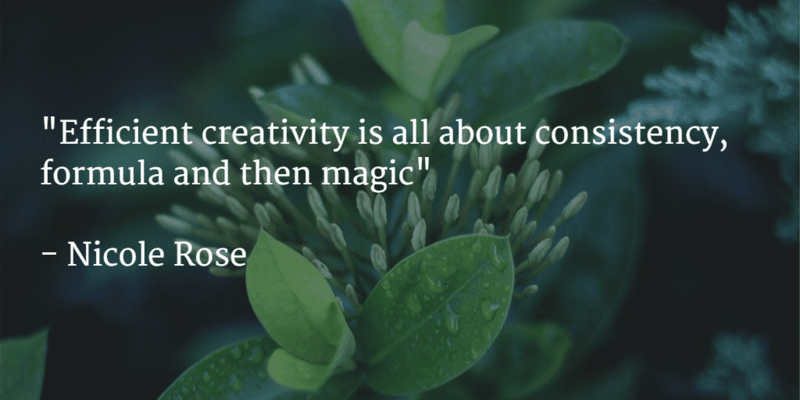 Therefore, I need to be creative as effectively and efficiently as possible. Clarify: Write down the problem/issue as clearly as possible. Focus: Write down the key messages. Brainstorm: On a piece of paper I scribble and draw as many ideas as I can as quickly as possible. Nicole Rose is a lawyer, artist and trainer whose company, Create Training, is taking the world of workplace training by storm. 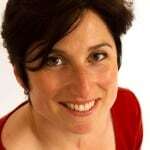 Nicole and her team of animators and artists produce brilliant, short, unique online training, which have received overwhelming acclaim by clients and learners alike. These include Rio Tinto, Wesfarmers, LinkedIn and Airbus to name but a few. Check out some of her work here and you will never look at training the same way again. 1. Open your mail over a bin so if it’s rubbish you put it where it belongs and don’t give it a second thought! 2. Have a clean, clear workspace. This will assist you to focus on the task at hand and avoid unnecessary distractions. Remove the temptation to procrastinate! 3. Use technology as appropriate to assist you. At an enterprise level, utilise data entry automation technology to minimise low value, error prone tasks and leverage electronic workflow tools to ensure that the right people interact with your processes and only where/when necessary. 4. On a personal level, small things can make a difference, e.g. use an electronic tasking and appointment tool (like MS Outlook) to schedule your prioritised tasks/appointments… and stick to the schedule wherever possible! 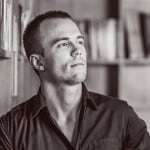 Lee Fisher is the CEO and Co-Founder of the Efficiency Leaders Group of companies and Innovation Winner in the Gold Coast Young Entrepreneur of the Year Awards (2014). Lee is a consulted thought leader in business process efficiency and has lead Efficiency Leaders from conception through to a very successful, multi-million dollar, global award winning organisation. I have found the key to massive productivity is not just learning to delegate, but having the right tools to make it as simple and effective as possible. Having to type out a task and assign it to my VA can sometimes take up more than half the time it would have taken for me to do it myself – take booking a meeting for example. That is where Say It Mail It and Podio come in. Say It Mail It is a nifty little app for your phone or tablet where you can record a voice message and email it immediately. 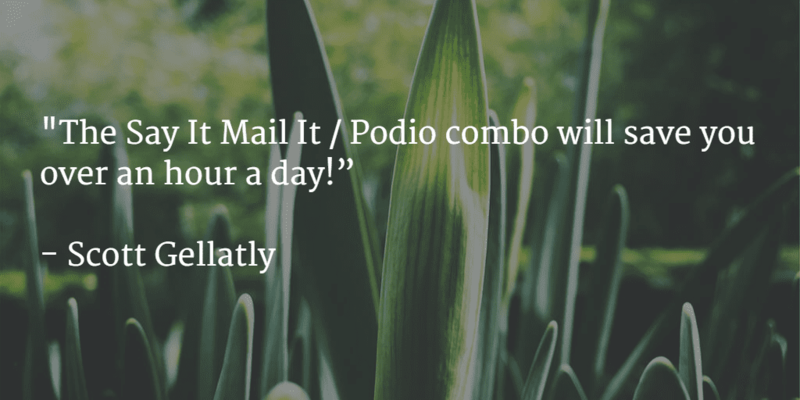 Podio’s ’email to task’ feature enables you to delegate tasks to a team member via a special email. Matched together you have – voice to task! When you’re lying in bed and have a brilliant idea, when you’re driving in the car and remember you need to organise a follow up, or just when you are sitting at your desk and it would be faster to record a voice message, then use the Say It Mail It / Podio combo. It will save you over an hour a day! Scott Gellatly is the founder and system architect at Bollo Empire, which supports disruptive agencies scale and grow through the power of Podio. 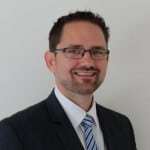 Scott has over a decade of experience working as a Business Analyst and Project Manager, developing expert knowledge in system architecture, project management and business process design. 3 weeks ago, I eliminated business email from my life. In the last 3 weeks, I’ve logged into my business email account less than 5 separate times, and only to grab a few documents I needed… not to reply to anything. 4 – When they log in, you’ll get the authentication code. Text it to your awesome person so they can log in. The cookie will remain active for 30 days. The double authentication prevents your awesome person from getting hacked and your password getting stolen. 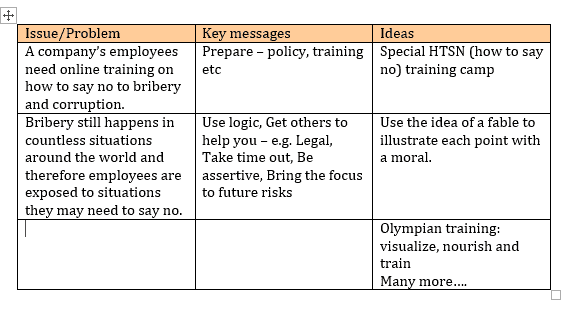 5 – Create an SOP with your “email rules”. 6 – Do 1-2 Skype calls as training and have your awesome person process a few emails with you on the phone. 7 – Your awesome person then logs into your email at 11am (or a time of your choosing), replies to everything they know how to reply to (this improves over time), and sends a simple bullet point report with a list of what they need your input on (to your personal email account). 8 – Download HT Professional Recorder and record a response to each bullet point (takes me less than 10 minutes, often less than 5), compress, upload direct to DropBox from your phone, and send the link to your awesome person. 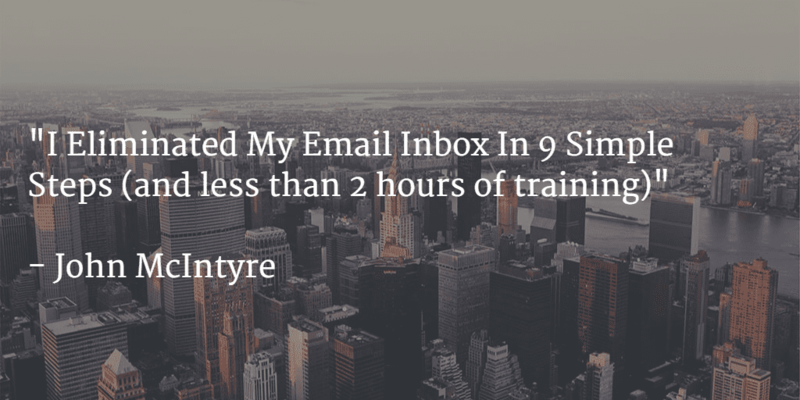 9 – Your awesome person executes your responses in the afternoon and……you hit inbox zero every day without ever logging into your business email account. Crack a beer to celebrate, and then get busy working on the vision and strategy for your company, instead of grinding away in your email inbox. John McIntyre helps ecommerce store owners increase their revenue up to 50% by implementing advanced email marketing programs. John can be found at TheMcMethod.com. Thanks to all of our guests for sharing some of the tips that make them so successful! Before trying to complete a task efficiently, ask whether it should be completed at all. If the task does need to be completed then aim to automate and / or delegate. Use technology to make the automation / delegation as simple and effective as possible. Even creative work is more productive if a process is followed. 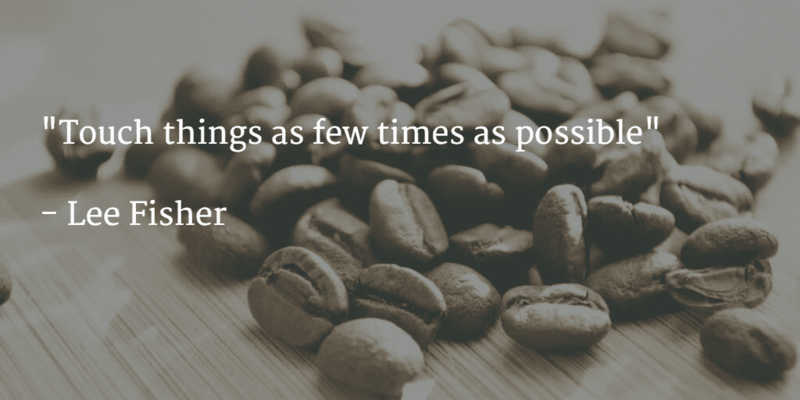 Minimise the amount of times something is touched by completing small tasks immediately rather than adding them to a to-do list. 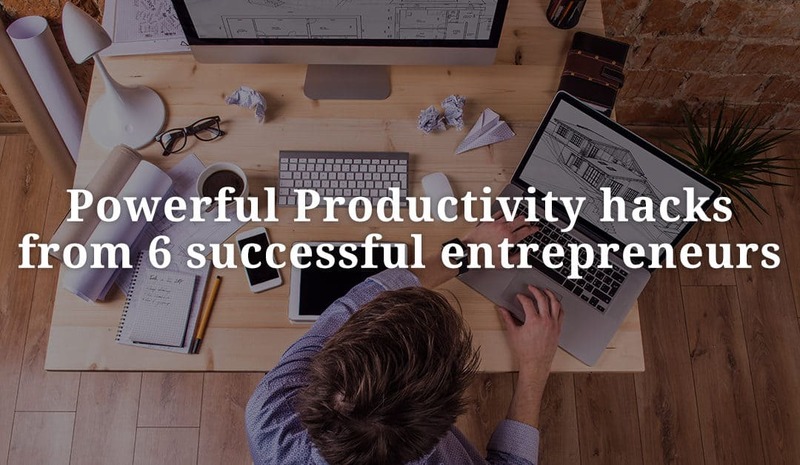 Have any of these productivity hacks worked for you? Have any tips of your own to share? Let us know in the comments.